Did you know that an estimated 70% of sports memorabilia is fake? We’re continuing our conversation with George Throckmorton, and he tells that the majority of those “Authentic” jerseys, balls, and bats are forged. How does he know? George: Over the years, I’ve done a lot of work on sports memorabilia. I had a Babe Ruth jersey that was selling for $750,000. Of course, we spend the bulk of our time discussing the Hofmann forgeries. How did Mark age them? George describes aging techniques that Mark Hofmann used to make his forgeries appear older than they were. But there was something wrong when George examined signatures. George: And as I put an ultraviolet light, there was some part that would reflect back and other parts that would not. And that really caused me some question. Why? If this document has been saved for over 100 years, why would you have some part that glowed and some part that did not, different inks, and so forth? And as I looked at it closer, I noticed the thing that made the document valuable was not the date itself, but the fact that it says, “obliged Joseph Smith.” And where it said, “obliged Joseph Smith” was where I saw different ink and I saw this white effect going around and I asked him that night, I asked him, I says, “Can you tell us where this came from?” Because before we started noticing some of these documents that have blue haze on the documents under ultraviolet light. Others did not. George: And so we separated them into two piles. And as I looked at those under the microscope, I noticed there was a characteristic of the ink would crack on some of them, not others. And then I noticed the ones with that blue haze, we’re also the ones that had that had the blue there, the cracked ink. And so, I told Bill. “Bill,” I says, “I think we got something here.” And I handed him a stack of documents and I says, “You give them to me, mix them up, give them to me and I’ll tell you which one came through the hands of Hofmann.” And he gave it to me and I looked under the microscope and he says, “this one did.” He gave me another one. “This one did not,” and so forth until we were through. 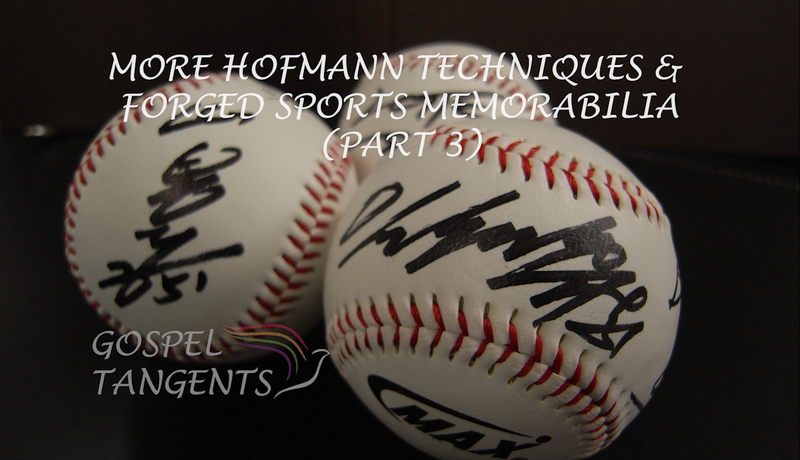 And all of them that had the cracked ink had Hofmann’s signature. An estimated 70% of sports memorabilia is forged. George Throckmorton describes how he found a $750,000 Babe Ruth jersey was forged. Next post: Who was the Third Bomb Intended for?